Finding the perfect home for your retirement isn't easy. Our guide will help you think through the process of choosing the right retirement community for you and your lifestyle. You may not need health care now, but it's a good idea to secure it now for your future. We are available to give tours Monday – Friday from 8:30 a.m. – 4 p.m. Please contact us to schedule a tour ~ (800) 642-2217. Call (800) 642-2217 to schedule a visit. Families are welcome, too. We are a part of UPMC Senior Communities, located in Cranberry Township, PA.
Our mission is to foster independence, health, physical and financial security to seniors who live here. Although most residents start out in an independent living residence, we provide personal care, memory care and nursing care as an individual’s needs change over time. 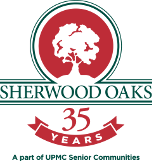 Interested in Volunteering at Sherwood Oaks? Call Recreational Therapy at 724-776-8471.